My favourite pen has died. It ran out of ink, writing in a coffee shop on Thursday morning. I have a bit of a thing for stationery, especially Japanese stationery. I spent more time and money than was probably necessary in Japanese stationery shops like Loft and Tokyu Hands. However, this pen was not bought in such a place. I got this pen in Monbetsu, a town known for its persistent fish smell, giant crab claw, huge bears, and a seal sanctuary. 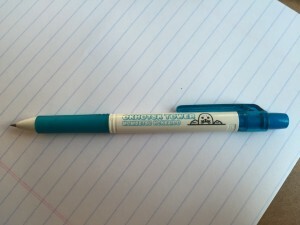 The day I got this pen, I was kissed by a seal at the seal sanctuary. The gift shop at the Monbetsu Sea Ice Museum provided me with this wonderful pen. It wrote smoothly, wasn’t too heavy or bulky, nor too thin. An excellent pen. Although I’m sad that my pen died, I always get a thrill when a pen runs out. It means that I’ve been writing! Thank you for your service, oh excellent pen. I wonder if I can go back to Monbetsu to find another one.